Approximately 275 active tutors in the Birmingham metro area help learners at The Literacy Council (TLC) of Central Alabama. Among them is Carolyn Gibson, a retired telecommunications worker who said she has always loved words and reading. She spends about four hours each week at the organization’s downtown location helping learners like Rochelle Robinson. The two women have built a rapport that makes learning easy, and Gibson feels like she is helping Robinson better navigate life. “That is what motivates me,” she said. When the clock strikes noon on a recent Wednesday morning, Robinson knows she has to leave. She has spent about two hours working with Gibson on her reading skills, but now she must catch a bus. As she gathers her things, Gibson stays put, writing notes about what the two have accomplished that day. “Are you going to work on this?” asks Gibson, calling after Robinson to remind her about a reading lesson they had been working on. Gibson heard about TLC years ago while watching television. “Now, I have the time to do it,” she said. Another tutor, Nez Calhoun, recently started volunteering at TLC after retiring from the Jefferson County Board of Education in November. She decided to use some of her newfound freedom to work with the organization, which she learned about from a friend who shared her experiences about volunteering with TLC. Calhoun took the organization’s required eight-hour training course, and now she spends a few hours on Thursdays tutoring. TLC President and Executive Director Katrina Watson said more volunteers and funding are at the top of the nonprofit’s wish list. July 12 at 5:30 p.m.
August 2 at 11:30 a.m.
September 6 at 5:30 p.m.
October 4 at 11:30 a.m.
After attending an orientation session, interested volunteers are invited to sign up for tutor training. 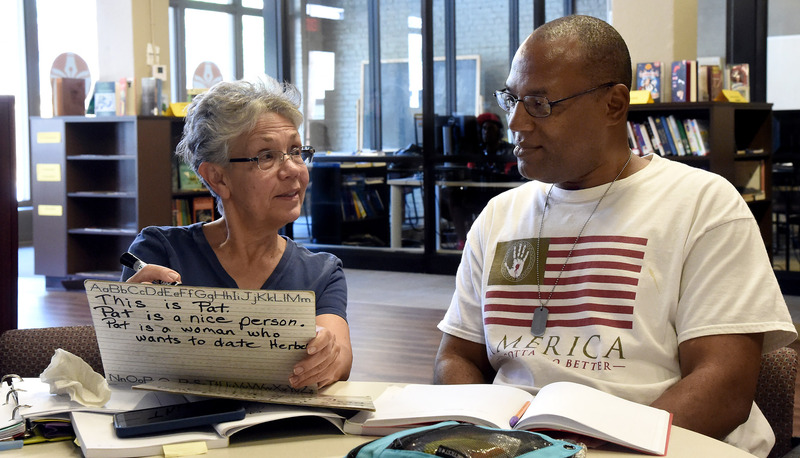 Adult literacy and English for Speakers of Other Languages (ESOL) tutor-training classes are held on Saturdays from 9 a.m. until 4 p.m., with an hour-and-a-half lunch break at noon. Both the orientation and tutor-training sessions are held at TLC’s downtown office: 2301 1st Ave. N., Suite 102, Birmingham, AL 35203; parking is available along 1st Ave. N. and 23rd St. N.
To read more about this series, click here.